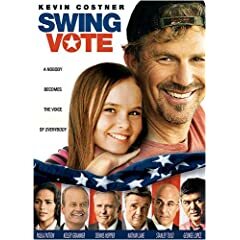 Burbank, Calif., October 17, 2008—An ordinary Joe accidentally gets the power to choose the next president of the United States in Swing Vote, a smart and timely comedy coming to DVD and Blu-ray Hi-Def on January 13, 2009 from Touchstone Home Entertainment. An all-star cast and a full slate of bonus features, including exclusive glimpses behind the scenes, filmmaker commentary and deleted scenes, light up an election year comedy about the power of one. Bud Johnson is content to coast through life in a dead end job, until his precocious twelve-year old, Molly, sets off a chain of events that results in a presidential election coming down to a single vote: Bud’s. Political operatives swarm his tiny hometown in New Mexico in an all-out battle for his ballot and there are no lengths the Republican incumbent Andrew Boone (Kelsey Grammer) and Democratic candidate Donald Greenleaf (Dennis Hopper) won’t go to in order to curry Bud’s favor. As the underhanded antics of their campaign managers, played by Stanley Tucci and Nathan Lane, create hilarious consequences, Bud realizes that beyond the implications for the nation, this is his shot at winning his daughter’s respect. as Molly, Johnson’s wise-beyond-her years daughter. • Inside the Campaign: The Politics of Production – Go behind the scenes for a look at the all-star cast, the real political pundits and the small town location of Belen, New Mexico that all combined to bring this movie to life. • Audio Commentary – Feature commentary with writer and director Joshua Michael Stern and writer Jason Richman. below. Last date for entries is January 22, 2009.